The sizes are permanently etched on each blade. The 342A Lang 15 Blade Metric Feeler Gauge is one of thousands of quality tooling products available from MRO Tools. 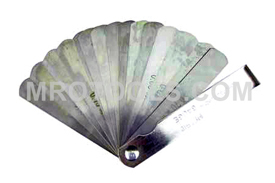 Please browse Lang Flat Gauges for tools similar to the 342A Lang 15 Blade Metric Feeler Gauge. 342A Lang 15 Blade Metric Feeler Gauge description summary: Lang 15 Blade Metric Feeler Gauge. Contains: Fifteen - 3'' x 1/2'' blades with thicknesses .06mm - .70mm. Quantity discounts may be available for the 342A Lang 15 Blade Metric Feeler Gauge. Please contact MRO Tools for details.